The Dutch-led international criminal investigation's conclusion that a missile from the Russian military downed Malaysia Airlines Flight 17 (MH17) over Ukraine in 2014 has brought fresh scrutiny to a Russian brigade identified as the source of the weapon. The Joint Investigative Team (JIT) announced on May 24 that it is convinced the Buk missile that brought down MH17, killing all 298 people on board, came from Russia's 53rd Antiaircraft Missile Brigade, based in the southern city of Kursk. The open-source investigation collective Bellingcat had previously identified that brigade as the source of the BUK missile launcher that the JIT says was used to shoot the plane down on July 17, 2014, over territory in eastern Ukraine controlled by Russia-backed separatists fighting Kyiv's forces. Much of the evidence cited by the JIT was previously identified in earlier Bellingcat reports. Top Dutch investigator Wilbert Paulissen noted at the news conference in Utrecht, Netherlands, Bellingcat's earlier reports alleging the role of the 53rd brigade in the tragedy, but stressed that the JIT had independently verified evidence that the Buk-TELAR in question came from the Russian Army unit. It was the strongest statement to date by the JIT implicating the Russian military in the downing of MH17, a tragedy in which Moscow has denied any involvement. Here's a look at some of the evidence that the JIT and Bellingcat have used to link the 53rd brigade to the missile that shot down the passenger plane. Using satellite imagery and a photograph posted on social media, the JIT notes that Buk systems were located in a parking lot on the base of the 53rd brigade in Kursk. Using social-media videos, photographs published online, and geolocation techniques, the investigation concludes that six Buk systems were part of a larger military convoy that left the base on June 23, 2014. Investigators then reconstructed the route, with the last available images of the convoy coming on June 25, 2014, about 25 kilometers from the Ukrainian border. The convoy includes a Buk missile launcher beginning with the number 3 -- indicating it was from the 3rd battalion of the 53rd brigade. Bellingcat, using the same videos, previously assessed that the missile launcher in question was number 332. This is the system the JIT says was used to shoot down MH17. The Downing Of MH17: What Happened? The Buk launcher that shot down MH17 appeared in Ukraine in several photographs and videos on July 17 -- the day of the tragedy -- and the following day, according to investigators. Comparing images of that Buk system from the convoy originating from the Kursk base and those taken in Ukraine reveals seven "fingerprints" demonstrating that they show the same missile launcher, the JIT says. These identical "fingerprints" include a center-of-gravity marking, the same partially obscured number beginning with the numeral 3, and a wheel with no spokes in the same spot. The head of the Dutch-led investigation, Fred Westerbeke, told the May 24 news conference that investigators are withholding more evidence in its possession from public release so as not to tip off potential suspects. But Bellingcat has published several reports linking the 53rd battalion to the military convoy that included the Buk missile system that the JIT says shot down MH17. One of these reports includes censored photos of drivers and the convoys of trucks that Bellingcat alleges moved the equipment into place in the weeks before MH17 was downed. 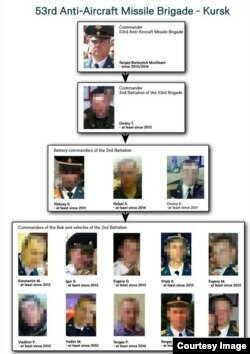 Another report, using open-source evidence that included social-media posts, identified potential suspects and witnesses in the downing of MH17 who served in the 53rd battalion. Westerbeke said on May 24 that the JIT was not prepared to announce the identities of potential suspects, but said those who came forward could be offered witness protection.